United Nations General Assembly (UNGA) resolution 61/105 in 2006 called “upon States to take action immediately, individually, and through regional fisheries management organizations and arrangements, and consistent with the precautionary approach and ecosystem approaches, to sustainably manage fish stocks and protect vulnerable marine ecosystems [VMEs], including seamounts, hydrothermal vents and cold water corals, from destructive fishing practices, recognizing the immense importance, and value of deep-sea ecosystems and the biodiversity they contain.” A number of other UNGA resolutions since have strengthened this guidance. Seamounts that have so far been surveyed by cameras, either towed or mounted on maneuverable submersible vehicles, have been found to have abundant VME indicator species (including xenophyophores on sandy areas) distributed on their sides and summits. Moreover, the distribution of vulnerable marinee cosystem (VME) indicator species is far more extensive than fishery bycatch data would suggest. We should therefore stop using VME indicator species and associated encounter and move-on rules in particular cases such as seamounts, and accept the fact that seamounts are, in the language of UNGA resolution 61/105, VMEs, and manage them as such. While seamount faunas have varying degrees of heterogeneity within and between seamounts (Kvile et al., 2014; Clark et al., 2015), the degree of uncertainty associated with attempts to extrapolate limited data in order to quantify vulnerability to human activities is sufficiently large (Taranto et al., 2012), suggesting the highest levels of precaution are necessary for management. 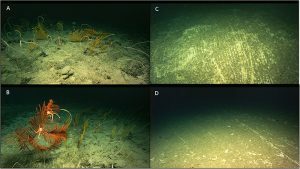 As true and functional VMEs, all seamounts should be protected in perpetuity from mobile bottom tending fishing gear and other forms of direct human disturbance including the mining of manganese crusts and other rare metals. International obligations under resolution 61/105, and other UNGA resolutions related to sustainable use of the global oceans and conservation of biological diversity, would make this the most rational decision. Previous Previous post: How could Nautilus Minerals get a social licence to operate the world’s first deep sea mine?